In a recent BP thread (http://briarpress.org/16821), Fritz Klinke wrote of the double pin marks on some 72 pt Munder Venezian in his possession. If I understand his posting correctly, he also implied that this type was cast on a Barth type caster rather than a pivotal type caster. This leads (for me at least) to a question. It’s an apparently simple question which needs a lot of “back story” involving technical details of typecasting machinery. I apologize for the length of this posting, then, but I’m asking the question quite seriously. I’d like to nail down the answer. The question is this: Do we know if ATF modified their Barths so as to produce pin marks on type (and if they did, on what evidence do we know this and how on Earth did they do it)? The pin mark is a by-product of a technical feature required as a part of the operation of some (but not all) pivotal type casters. It is produced by what Bruce (the machine’s inventor) termed the “discharging pin” - but I prefer John Carroll’s term “drag pin” instead. This is a stationary pin fixed to the top half of the mold. It projects very slightly into the casting cavity. In Bruce’s original design, its function is to provide just enough drag on the newly cast type as the mold opens so that the type will always adhere to the top half of the mold. 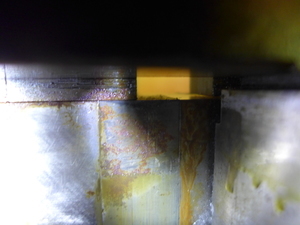 As the mold opens, the beard of the type hits the “stool” on which the matrix had banked (which is part of the bottom half of the mold) and is knocked free of the mold. The drag pin is a necessary component of those pivotals which use only Bruce’s original system, and of those which use it plus an additional mechanism at the jet-end of the type on the top half of the mold (only) to ensure that it really is knocked free (to be honest, I have not seen such a configuration). It is not necessary on those pivotals which employ mechanisms at the jet-end to knock type type free regardless of which half of the mold it sticks to. It is not necessary on Nuernberger-Rettig pivotals if they are equipped with the special N-R mold which casts the jet below the foot and breaks the jet automatically (they have a special notch to hold the jet to the bottom half of the mold, and a mechanism to knock both the type and broken-off jet free). The presence of two pin marks, if on type cast in pivotals, represents an interesting situation. Drag pins on both halves of the mold of a pivotal would defeat the purpose of the drag pin, because the type could stick to either side of the mold just as it would without any drag pin at all. You would need a machine equipped with some mechanism on the jet-end to knock the type free - the pin mark in this case is entirely ornamental. Now, drag pins are not required in any other kind of typecasting machine - just pivotals. The presence of a pin mark on type known to have been cast by non-pivotal machines indicates that someone modified the machine to produce a “faux” pin mark (that is, it’s a real enough feature of the type, but it’s there just for show). A machine such as the Thompson Type Caster which delivers its type straight into a channel where it is retained can be modified to produce a pin mark on one side of the type. On the Thompson this is done by inserting a fixed pin into the mold-cavity-end of the “Type Body Piece Plate” (aka “Point Blade”); this pin stands slightly proud of the Point Blade and may have something engraved on it. Type in the Thompson is cast nick-up (usually, or down for comp. mats). The Point Blade is on the right side of the type as viewed by the operator. 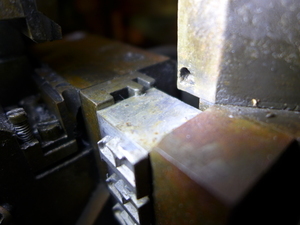 After casting, the Point Blade pushes the type straight left, out of the mold out to the Receiving Plate/Shoe. There it is retained by a Stripper Spring. 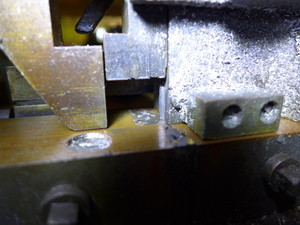 At no point does this raised pin interfere with anything (but you couldn’t modify a Thompson to cast *two* pin marks - an equivalent raised pin on the other side of the mold, the Vertical Mold Blade, would interfere with its motion). Both Baltotype and Charlie Broad’s Typefounders, Inc. of Phoenix are known to have modified their machines in this way. (I have an example ex-Phoenix Point Blade so modified). But Foucher-derived casters such as the Barth have a very different type delivery path. Type in the Barth is cast on its side, nick to the left. After it is cast, a large Slide at the top moves leftward and opens the mold. Then a Mold Body Piece moves vertically upward and discharges the type from the mold into a kind of vise attached to the same Slide. The Slide then carries the type rightward to a point where another mechanism pushes it straight down into a vertical delivery channel (which, finally, curves to the right and delivers the type to a receiving Stick). None of this mechanism requires a drag pin. But consider how you might modify a Barth to produce a “faux” pin mark. First, you could try to add a pin to the Mold Body Piece. This would cast a pin mark into the type, true. But to discharge the type from the mold the Mold Body Piece must raise up so that it is flush with the top of the mold. The Slide would then slice off your raised pin. 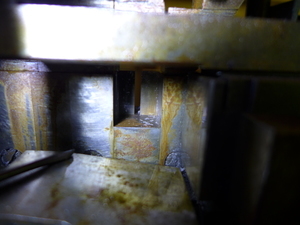 Neither is it going to work to add a raised pin to the part of the mold closing off the other (top) side of the type - this is the Slide itself, the bottom of which must be flush with the top of the mold cavity. I may be missing something - I’m still very new to the Barth - but I can see no way in which it could be modified to produce a pin mark as it casts a type. There is one possible complication/addition. 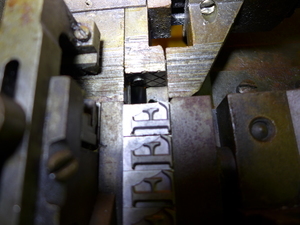 In the one surviving 60pt Barth, in the piece which pushes the type down into the vertical-then-curved delivery channel, there IS an inset pin. I suppose that one could argue that this was intended to punch a mark into the type during delivery - newly cast type is still relatively soft. But the last type cast in this machine is still in its delivery channel, and there is no sign at all of a pin mark on it. In any event, punching a mark into the type would distort it without any possibility of dressing off this distortion - I can’t imagine ATF doing that. My current guess (and at present it is just a guess) is that this pin functions to keep the type from sticking to the downward-pushing piece. It is not mentioned in the Barth patents (but they describe a slightly different mechanism, and show machines for much smaller type). I’ll attach a few photographs of the mold and delivery “pin” of the 60pt machine. … BP just had a small server hiccup, so I might have to add them to a subsequent post. In any case, I apologize for the length and detail of this posting. But so far as I can figure, pin mark = not Barth. I’d like to learn for sure if this is true or false. Perhaps my post was a bit confusing—the 72 pt Munder with the 2 pin marks is pivotal cast, definitely not Barth, and that it had 2 pinmarks, one on each side of the body seemed unusual to me. The 6 pt Munder I referred to is pivotal as it has a pin mark, the 8 pt Cooper Fullface has no pin mark and was cast on an automatic machine, likely a Barth. I did not intend to imply that Barths had pin marks. What I was offering was that none of the BB&S type I have shows an additional nick on the back of the type at the top of the body. I can’t access my older 1880/90s vintage BB&S type at the moment to see the nicking arrangement. Nicks can be added after casting which was common. Theo Rehak had the tools from ATF at his foundry and demonstrated it for me, so I’m well aware of the procedures. Adding nicks to type is done on the dressing bench with a special plane. And nicks can vary—I have Bulmer cast at ATF in the 1930s that has a different nick location from more recent castings and the simple explanation is that there was more than one machine for each point size and the nicks depend on the mold on the particular machine. Molds also had to match depth of drive, and all that information was on the card that was maintained for each suite of matrices, as Theo referred to them. And ATF used pivotals up to the end for certain items that could not be cast on a Barth. When Theo cast the 24 pt Engravers Roman for me, the set widths of the M and W were too wide for the Barth mold so he cast those on the pivotal—thus that font is a mix of Barth cast and pivotal cast type. Thanks - that makes sense now. I had mis-read your earlier posting at the same time I discovered a “pin that was not a pin” on the delivery channel pusher of the 60pt Barth; hence my confusion.